For the air base, see Andreapol (air base). Andreapol (Russian: Андреа́поль) is a town and the administrative center of Andreapolsky District in Tver Oblast, Russia, located on the Valdai Hills on the left bank in the upper course of the Western Dvina River. Population: 8,286 (2010 Census); 9,317 (2002 Census); 9,610 (1989 Census); 12,000 (1968). The Dubna Volost, currently a part of Andreapol, was mentioned in the chronicles in 1489. After several wars between Moscow and Lithuania, during which the area was transferred to Lithuania and back, it was in 1508 again included to the Grand Duchy of Moscow. In the course of the administrative reform carried out in 1708 by Peter the Great, the area was included into Ingermanlandia Governorate (since 1710 known as Saint Petersburg Governorate), and in 1727 Novgorod Governorate split off. In 1772, as a result of the First Partition of Poland, Pskov Governorate was created, and the area on the right bank of the Western Dvina was included into Toropetsky Uyezd of Pskov Governorate. In 1777, Pskov Governorate was transformed into Pskov Viceroyalty, and in 1796, the viceroyalty was abolished, and Pskov Governorate was restored. Between 1810 and 1843, a spa resort was operating in Andreapol, at the time Adreyano Pole. Between 1904 and 1907, the construction of the railroad to Bologoye was completed. In 1906, the station of Andreapol was opened, and the selo of Andreapol, which included villages of Dubna, Andreyano Pole, and Gorka, was established. The name of Andreapol is an adaptation of Andreyano Pole. On August 1, 1927 Pskov Governorate was abolished, and Leningrad Oblast was established. Toropetsky Uyezd was abolished as well, and Leninsky District, with the administrative center in the selo of Khotilitsy was established. It belonged to Velikiye Luki Okrug of Leningrad Oblast. In 1928, the district center was moved to Andreapol. On June 17, 1929, the district was transferred to Western Oblast. On August 1, 1930 the okrugs were abolished, and the districts were subordinated directly to the oblast. On January 29, 1935 Kalinin Oblast was established, and Leninsky District was transferred to Kalinin Oblast. In 1938, Andreapol was granted urban-type settlement status. Between September 1941 and January 1942, during World War II, Andreapol was occupied by German troops. On August 22, 1944, the district was transferred to newly established Velikiye Luki Oblast. On October 2, 1957, Velikiye Luki Oblast was abolished, and Leninsky District was transferred back to Kalinin Oblast. In February 1963, during the abortive administrative reform by Nikita Khrushchev, Leninsky District was merged into Toropetsky District. On January 12, 1965 Andreapolsky District was established in the areas which previously belonged to Toropetsky and Ostashkovsky Districts. In 1967, Andreapol was granted town status. In 1990, Kalinin Oblast was renamed Tver Oblast. Within the framework of administrative divisions, Andreapol serves as the administrative center of Andreapolsky District. As an administrative division, it is incorporated within Andreapolsky District as Andreapol Urban Settlement. As a municipal division, this administrative unit also has urban settlement status and is a part of Andreapolsky Municipal District. Forests cover around 70% of the district's territory. As a result of that, logging industry provides substantial revenue for the town. There is a large saw-mill plant in Andreapol as well as porcelain production. Agriculture is also of fundamental importance to the town's economy. The railway connecting Bologoye with Velikiye Luki passes Andreapol. There is infrequent passenger traffic. A paved road connecting Ostashkov with Zapadnaya Dvina via Peno runs via Andreapol. There are local roads as well. There is bus traffic in the district. The town is home to Andreapol air base, an important interceptor aircraft base guarding Moscow. Andreapol contains three cultural heritage monuments of local significance. Two of them are monuments to soldiers fallen in World War II, and the third one is an archaeological site. There is a local museum in Andreapol. 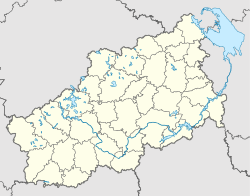 ^ a b c d Law #34-ZO stipulates that the borders of the settlements (administrative-territorial divisions) are identical to the borders of the urban and rural settlements (municipal divisions), and that the borders of the administrative districts are identical to the borders of the municipal districts. Law #17-ZO, which describes the borders and the composition of the municipal formations in Andreapolsky Municipal District, lists the town of Andreapol as a part and the administrative center of Andreapol Urban Settlement of that district. ^ a b Государственный комитет Российской Федерации по статистике. Комитет Российской Федерации по стандартизации, метрологии и сертификации. №ОК 019-95 1 января 1997 г. «Общероссийский классификатор объектов административно-территориального деления. Код 28 202», в ред. изменения №278/2015 от 1 января 2016 г.. (State Statistics Committee of the Russian Federation. Committee of the Russian Federation on Standardization, Metrology, and Certification. #OK 019-95 January 1, 1997 Russian Classification of Objects of Administrative Division (OKATO). Code 28 202, as amended by the Amendment #278/2015 of January 1, 2016. ). ^ a b "Андреапольский район" (in Russian). Тверская ОУНБ им. А.М. Горького. Retrieved December 4, 2015. ^ "Псковская губерния" (in Russian). Руниверс. Retrieved December 4, 2015. ^ a b c d "История Андреапольского района" (in Russian). Andreapolsky District Administration. Archived from the original on December 8, 2015. Retrieved December 4, 2015. ^ Воробьёв, М. В. (1993). Г. В. Туфанова (ed.). Административно-территориальное деление Смоленской области (in Russian). Государственный архив Смоленской области. pp. 118–133. ^ a b c Справка об изменениях в административно-территориальном делении Тверской губернии - Калининской области (in Russian). Архивы России. Archived from the original on April 19, 2012. Retrieved December 5, 2014. ^ "Андреапольский районный краеведческий музей" (in Russian). museum.ru. Archived from the original on November 22, 2015. Retrieved December 1, 2015. Законодательное Собрание Тверской области. Закон №17-ЗО от 28 февраля 2005 г. «Об установлении границ муниципальных образований, входящих в состав территории муниципального образования Тверской области "Андреапольский район", и наделении их статусом городского, сельского поселения». Вступил в силу со дня официального опубликования. Опубликован: "Тверские ведомости", №10, 11–17 марта 2005 г. (Legislative Assembly of Tver Oblast. Law #17-ZO of February 28, 2005 On Establishing the Borders of the Municipal Formations Comprised by the Territory of the Municipal Formation of "Andreapolsky District" and on Granting Them the Status of Urban and Rural Settlements. Effective as of the day of the official publication.). This page was last edited on 17 October 2018, at 16:36 (UTC).